This article of Geeabo tells you about the Top 20 Free Social Bookmarking Sites List 2018 – High PR. Friends, everybody wants to promote their website, blog, services, products, articles in the search engine to earn more and more money. But friends, if this happen without any investment then how you feel? So friends, it is possible to promote your online business without any cost. Reduce WordPress Blog Loading Speed. Friends, We all know about Facebook, Twitter, Google Plus, Instagram. No doubt that these are the biggest social networking sites. But apart from these there are also so many more social networking site where huge number of audience also comes everyday. So, today I’m going to tell about those sites. But before knowing about those sites let’s read something about Social Bookmarking. Free Social Bookmarking Sites List are those sites where you can share your web pages, articles, etc. And those people who are on that social bookmarking sites can easily see your post. And they can search for the related articles and they can also search for the services that you offer. Friends, Free Social Bookmarking Sites List are those sites from where you can get a large number of better audience. So, In every case social bookmarking is beneficial for you if you think about marketing of your web pages. BizSugar is a social bookmarking and networking site. Here you can share your blog post, articles, videos and other contents. Delicious is a social bookmarking web service. And this web service is for storing, sharing, and discovering web bookmarks. Digg aims to pick stories for internet audiences specifically for science, trending political issues, viral internet issues and many others. Folkd is a social networking site. Folkd helps you to keep track of your bookmarks and see what your friends bookmark as well. Fark is a community website. And Fark allows its member to comment on group of different article. The site receives many story submissions per day. But approximately 100 of them are publicly displayed on the site. Pinterest is a very popular social networking site. Here, you can share your website, web pages, blog post, article, etc. by registering on it. Reddit is an American social news aggregation, web content rating, and discussion website. Registered members can submit content to the website such as links, text posts, and images. StumbleUpon is a discovery engine. And it finds and recommends web content to its users. Its allow users to discover and rate Web pages, photos and videos. Storify is a social network service. Storify helps you to create stories or timelines using social media such as Twitter, Facebook and Instagram. Myspace is a social networking website. Myspace offering an interactive, user-submitted network of friends, personal profiles, blogs, groups, photos, music, and videos. CiteULike is a web service. And it allows users to save and share citations to academic papers. Slashdot (/.) is a social news website. It features news stories on science, technology, and politics that are submitted and evaluated by site users and editors. Create and grow your online presence in minutes by publishing curated content. Plurk is a free social networking and micro-blogging service. This allows its users to send updates through short messages or links, which can be up to 360 text characters in length. Tumblr is a very popular social networking site. And it is a perfect place to express yourself, discover yourself, and bond over the stuff you love. It’s where your interests connect you with your people. LinkARENA Social Bookmarking – Social Bookmarking und Web 2.0 Suchmaschine. Foursquare is a social networking and bookmarking site which helps you to find the right place to go with friends, and find the best food, nightlife, and entertainment in your area. BoingBoing is a website related to common topics. BoingBoing includes technology, futurism, science fiction, gadgets, intellectual property, Disney, etc. Disqus is a global blog comment hosting service for web sites. They offer various features like social integration, social networking, user profile, email notifications, mobile commenting etc. 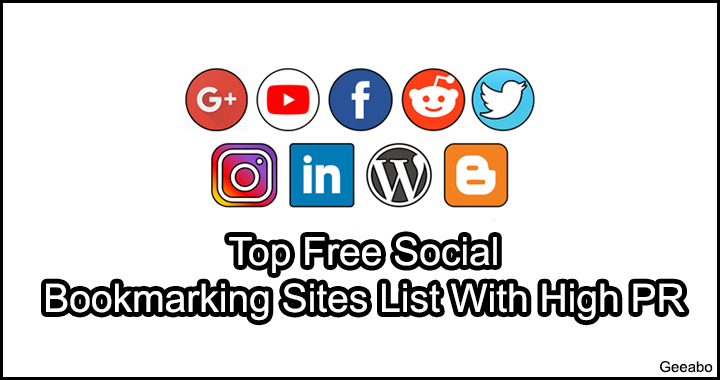 So, this was the list of Top 20 Free Social Bookmarking Sites List 2018 – High PR. Easy Way To Hide WhatsApp Notification In Android Phone. Best social bookmarking sites post by you. Thanks a lot bro for this useful information on list of bookmarking site with high Domain Authority. I will share with my other friends. I really wanted to type a remark to be able to say thanks to you for all the unique guides you are sharing at this site. My time-consuming internet investigation has at the end been recognized with useful insight to talk about with my friends and classmates. I would believe that most of us site visitors are truly endowed to exist in a useful site with very many lovely individuals with good techniques. I feel extremely lucky to have used your web site and look forward to tons of more fabulous moments reading here. Thanks once again for all the details. You just provided an amazing list of websites.